We butchered this year's crop of 51 Cornish-X chickens last weekend. I set up the equipment in our backyard in the morning and we started "processing" right after lunch. My son James gathered the birds, hung them upside down, cut their necks so they bled out, then scalded and plucked them, two at a time, before handing them off to me. He's an old pro at 13 years old. I eviscerated every bird and cleaned them up before depositing each one in a big cooler of cold spring water. Marlene took care of bagging the birds for the freezer. My 16-year-old son, Robert, stayed busy in different capacities helping as needed. It was a team effort and an excellent example of the "family economy" in action. We finished up the final chicken just before 8:00. James rigged up a light so I could see to process the last few. That translates into one butchered-and-packaged critter about every ten minutes. But we were not trying to break any records. We just plodded along, and took our share of little breaks. The next morning Marlene finished canning 18 quarts of good chicken stock while the boys and I cleaned up our processing area and put the equipment away. So, after nine weeks of raising chickens in the front yard, and a day of processing, we once again have enough chickens in the freezer for another year. It's a good feeling to have that job done! Ten years ago, when we raised and processed meat birds for the first time, it was new and difficult, and more than a little offensive. But with the proper equipment and some experience, we've discovered that butchering your own chickens can be as simple as picking strawberries and making jam. Well, almost. I no longer mind the act of harvesting chickens. In fact, I look at every chicken as an opportunity to become better skilled and more proficient at the task of butchering. Such work is, ultimately, a rural craft that I take satisfaction in doing. I have come a long way to make a statement like that. The pictures at that essay show my homemade Whizbang Chicken Plucker, and my homemade Whizbang Chicken Scalder. I could certainly process chickens without these devices, but it would not be nearly as fast, easy, and efficient (not to mention FUN) to do. If you have never eviscerated a chicken, I have posted a step-by-step, detailed, how-to photo essay on the subject at this link: How to Butcher a Chicken. That link will also take you to information about how Marlene makes and cans chicken stock. My point in relating all of this is that if I and my family can learn to raise and butcher our own meat birds, so can you. Once you've gotten through the learning curve, and have some good tools to help you, it's not difficult to do and, like I said, it's a good feeling to be stocked up for the year. 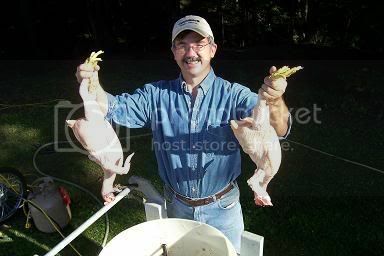 I remember the process of butchering chickens well. I was the one who scalded and plunked. My mom did the other more gory stuff. It will soon be my turn to do it all. God is awonderful and a great provider! When we were ready to butcher chickens earlier this year, I used your step by step blog as a guide - even though I had done it years ago - my memory was rusty. I hope to get better and faster as we do it more. But for this week - we have ducks to butcher! But even though we didn't do the processing ourselves, it was a wonderful thing to watch. My kids (6, 5, and almost 2) were a little nervous before we went, but the family who did it was wonderful, and answered all 147 of our questions, and let the kids help out in little ways. We hope to be able to process our own birds at some point, but it's enough for us right now that we raise our own birds and take them to someone else to have them 'done.' And I've been so spoiled by our fresh eggs that I'll never, ever be able to go back to those old store eggs! Thanks for this post, I can't wait to check out the links you added. Sonya, Good knives ARE a must. I think I discuss (and provide links to) the two knives I use in my "How to Butcher a Chicken" tutorial. I am partial to a 5" boning knife made by Chicago cutlery. In fact, that is the only knife I now use to butcher chickens. I have used it from the beginning of my chicken processing days and it might last to the end. The blade sharpens well and holds an edge well. You will need to learn to sharpen and use a butcher's steel to keep the blade sharp. It is not hard to do. I discuss knives and the butcher's steel in my plucker plan book. For sharpening I use a simple knife sharpening stone in my electric drill. We aren't sure if we really enjoyed raising those chickens though. We have 17 egg layers (RIR's) that give us great joy, but the meat birds were a bit depressing. They just sat there and ate . . . didn't even come out of the coop. Hopefully we will find another breed that is a bit livelier for our next attempt. Thanks for all of your blogging. I've become very interested in your writings! What kind of bags do you freeze them in? I'm grateful for your careful explanations, we hope to be raising our own chickens in the near future, just enough to fill the family freezers and we both decided to go with the Cornish Crosses--although we decided separately then were happy to discover we were in agreement! Thanks to your site my family processed 25 birds ourselves! I learned a lot. I made 3 big mistakes. I bought them too late, let them grow for too long (16 weeks) and did the processing in July with temps over 100! Never again. We are a family of 8, soon to be nine so I will up the order to 50 for next year and have those birds in the freezer by the end of May! Even though it did not go perfectly we still did it. Thanks again. Thank you so much for posting your step by step directiond to chicken processing! I printed them off and studied them for a few days until I felt comfortable enough to do it. Out of 13 chickens we ended up with 4 roos, and 3 had to go. I finally got up enough nerve to do it and set things up. I caught the birds and we hung them upside down. I could not bring myself to cut them. Thankfully my huisband did that for me (the last one we just used a chopping block and an axe). I took it from there and finished the processing according to your directions. I do not have a chicken plucker but a cooler of hot water and quick plucking action made quick work of the feathers. It took us 4 hrs start to clean up for the 3 birds but it was a learning process. Now I have 6 half chickens in the freezer to feed me family. Thanks again. Didn't get Whizbang Chicken Plucker parts in time to butcher 6 roosters. Your articles were sure helpful. Even so, it took us nearly an hour to process a bird. It was over 100 degrees. No telling how long it would have taken without the tips from your articles. One thing we did happen upon....hand plucking is quick and easy if you put on latex (hospital-type) gloves. My husband and son hung the birds from a tree limb and then just pulled their gloved hands down the bird and the majority of feathers fell to the ground. A few more passes and the birds were ready for gutting. Am anxious to see the plucker work. Will have it ready in a few weeks before we tackle the 50 Cornish X's we got last week. Would appreciate any tips on raising Cornish X's. We purchased 50 RIR's and 50 Cornish X's. The RIR's have done fine, no losses but several Cornish X's appeared to have been trampled even though there was more room in the oval water tank we had them in than in the tank we had the RIR's in. Seems they need more heat than the RIR's. Need to get them outside and into our version of a chicken tractor, but concerned about keeping them warm. It is still in the 90's here during the day, but lows in the lower 60's at night. Any helpful experiences on brooding these chicks would be appreciated. What type of seed would you plant for greenery for the chickens to forage on while in the chicken tractor?